Not writing about pop culture today. I felt it was important to put some thoughts down about election results and our future. Everyone else is writing long, painful, sometimes smart and insightful, essays so I decided to just write a poem. Like December 7, 1941, and 9/11. 19 percent in rural areas. To be taken in by the orange pirate? On the streets of our cities. Is this “America the mean,” as my friend Charles wrote today? Just like the Brexit orphans in Britain. Can he do in four years? Is our Bill of Rights in danger? This year is the 80th anniversary of the beginning of the Spanish Civil War, an important moment in history that has never received the attention it deserves as a prequel to the geopolitical changes of World War II, the Cold War and the culture wars that continue today. The following essay is adapted from the reading I gave at Third Coast Review’s Kill Your Darlings live lit and improv series last month. We certainly would have supported the anti-fascist, Republican cause in the Spanish Civil War. The democratically elected government of Spain was anti-fascist, anti-clerical, anti-royalty, pro-education and yes, pro-communist. in those years, we sat in saloons and union halls — in Brooklyn, Queens and Staten Island, near stockyards and steel mills on the south side of Chicago – talking about unemployment, the evils of capitalism, the rise of fascism in Europe and the hope we saw in Spain. And some of us did something about it. Some of us went to Spain. The Spanish Civil War was fought from 1936 to 1939. The novel thing about this war was that volunteers from America and around the world went to Spain to fight for the good cause. Children giving the Republican salute in Madrid. That good cause was our support for the legal, democratically elected, left-wing Republic of Spain, which faced a military coup by the fascist Spanish military led by Francisco Franco. The slogan was No pasarán and a raised fist. They shall not pass. If I had been a young woman in the 1930s, I would have wanted to be on the ship that left New York harbor in December 1936—80 years ago. That was the first ship that took American volunteers to Spain. The people who went left without telling anyone their destination or talking to anyone about it on board ship. They knew they were committing an illegal act—because the State Department had banned all travel to Spain and those who went risked losing their citizenship. A total of 45,000 volunteers from 53 countries formed the International Brigades who went to Spain in late 1936 and early 1937. Most of them traveled by ship to France and then had to travel by train to southern France and on foot during the night across the Pyrenees to Spain. From the US, 2,800 left but a third of them didn’t come back. The American section of the International Brigades was known as the Abraham Lincoln Brigade. Two hundred Chicagoans were among the volunteers. I’m sure I knew some of them. They were men with names like Paul Lutka, Sid Harris, Milt Cohen, Sam Gibbons, Charles Hall, Ed Balchowsky, Steve Nelson. And Oliver Law, an African-American who couldn’t serve as an officer in the Jim Crow US Army in World War I, but was a battalion commander in Spain. He died in battle a few months later. You can see some of them interviewed (and Balchowsky playing the piano) on the excellent 1984 documentary, The Good Fight: The Abraham Lincoln Brigade in the Spanish Civil War, narrated by Studs Terkel. The film is available to see and stream on Vimeo. If I had gone to Spain, I would have been a photographer or a journalist, or perhaps a driver or nurse. Very few women were in combat. Most of the volunteers I would have met were from New York or San Francisco. They were mostly urban working class. About a fourth were Jewish, about 90 were African-American. Many were the children of Eastern Europeans who came here after World War I. They left to escape political repression and economic distress in their home countries. In many ways, the Spanish Civil War was a culture war—urban against rural, modernity against tradition, freedom of expression against repression of ideas. The International Brigades were sent out to the front lines with poor quality equipment, no uniforms—often little food or water–and little or no training. Some of them had never handled a gun before. But the internationals were shock troops for the Republic. That’s one of the reasons their death toll was so high. Their remains are on battlefields named Jarama, Guadalajara, Brunete, Belchite, Teruel, the Ebro River. Fascist Germany and Italy contributed weapons, warplanes, warships and 100,000 troops to the Nationalist cause—the fascist or Franco side. Russia and Mexico contributed some weapons and advisers to the Spanish government—the Republican side–but it was minimal compared to what Germany and Italy did. What did the US do? Nada. The US, Britain and France refused to support the Spanish Republic. They wouldn’t even sell them munitions or oil, even though Spain had plenty of gold to pay for them. The war ended in 1939 as the fascists gradually rolled over all of Spain. Barcelona and Catalonia, the heart of the Republican cause, fell in January and February–and Madrid in March. Franco declared victory; his government was recognized by the good old USA. Democracy died in Spain. Franco ruled as the dictatorial Caudillo until he died in 1975. 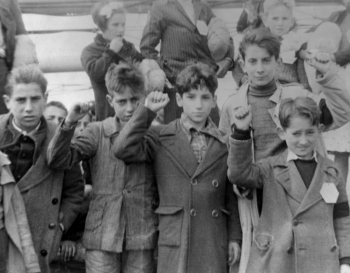 The veterans of the Spanish Civil War continued to be political activists who later supported the civil rights movement and antiwar movements. The last American veteran died in February. He was Delmer Berg, who died at 99. Part of my Spanish Civil War library. I tell this story because I believe we need to remember the Spanish Civil War and teach our kids about it. Why was it important? It was the prequel to World War II and the Cold War. And it prefigured the culture wars of today. The American volunteers went on their own dime to Spain. And most of those who returned were ostracized and threatened by the US government, the FBI and the House UnAmerican Activities Committee for the rest of their lives. The war inspired many artists, writers, journalists and photographers. George Orwell wrote a memoir Homage to Catalonia about fighting with the POUM, the anarchists, a splinter group of Marxists. Ernest Hemingway covered the war for the North American Newspaper Alliance and gathered material for his novel, For Whom the Bell Tolls. Photographer Robert Capa shot some memorable images, including the iconic image titled “Falling Soldier,” which shows a Republican soldier being shot down. Poet and playwright Federico Garcia Lorca, a Spaniard, was kidnapped and executed by the Franco thugs. His body was tossed in a mass grave and his remains have never been found. There were many others. Paul Robeson, Langston Hughes, Andre Malraux, Salvador Dali, Martha Gellhorn, Willy Brandt, W.H. Auden, Arthur Koestler, Emma Goldman, Lillian Hellman and John Dos Passos were involved in various ways. Picasso’s famous painting, Guernica, captured the aftermath of the vicious aerial attack on the Basque town of Guernica in April 1937 by German bombers flown by German pilots. About 1,650 people were killed, mostly women, children and old men, because the other men had gone off to fight the fascists. The bombardment of Guernica became a world symbol of the horrors of war. Picasso had left Spain and refused to return or to have his art displayed there as long as Franco was in power. Guernica’s home for years was the Museum of Modern Art in New York, where I saw it in the 1970s. Then recently I saw it at the Museo de Reina Sofia in Madrid, where it is now permanently installed. Back to the present, I think we should vow to celebrate this moment in history by becoming knowledgeable about the Spanish Civil War. Here are my suggestions for how you might do this. 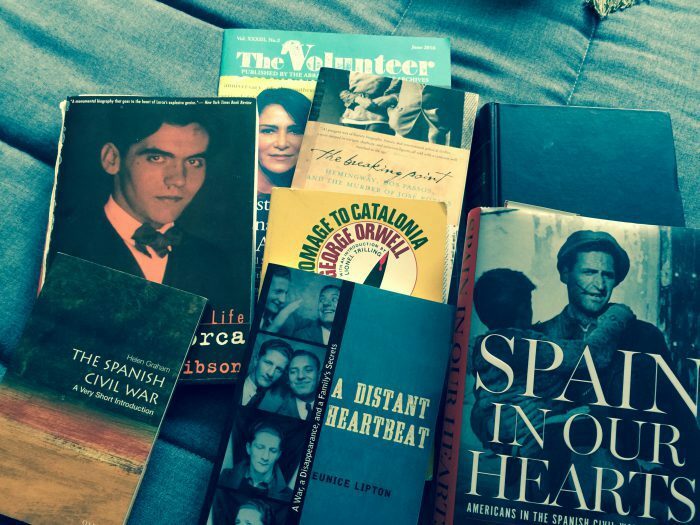 First of all, explore the resources of ALBA, the Abraham Lincoln Brigade Archives, a nonprofit dedicated to promoting social activism and the defense of human rights, as well as the history and legacy of the Spanish Civil War. You can sign up for ALBA’s mailing list here. Ernest Hemingway, For Whom the Bell Tolls (1940). The story of Robert Jordan, an American, who goes to Spain to fight with the International Brigades. Helen Graham, The Spanish Civil War: A Very Short Introduction (2005). A good resource for a basic history and timeline of the war. 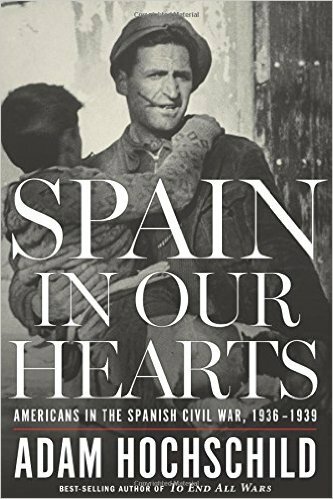 Adam Hochschild, Spain in Our Hearts: Americans in the Spanish Civil War (2016). An engrossing history drawn from the letters and diaries of the participants. Peter Carroll, The Odyssey of the Abraham Lincoln Brigade: Americans in the Spanish Civil War (1994). Carroll had the advantage of interviews with some of the living veterans of the war. George Orwell, Homage to Catalonia (1938). Orwell’s memoir about his time fighting with the POUM in Spain. Cary Nelson, ed., The Wound and the Dream: Sixty Years of American Poems About the Spanish Civil War (2002). An excellent collection of poetry edited by a UIUC professor and published by the University of Illinois Press. Hugh Thomas, The Spanish Civil War (1961, rev. 2001). This is the definitive history of the war by the distinguished British historian. For Whom the Bell Tolls, dir Sam Wood (DVD, 1943). It was a box office hit and nominated for nine Oscars. The bridge-detonation scene is based on Hemingway’s actual experience. The Good Fight: The Abraham Lincoln Brigade in the Spanish Civil War, dirs Noel Buckner and Mary Dore, narrated by Studs Terkel (Vimeo, 1984). Land and Freedom, dir Ken Loach (parts are on Vimeo, 1995). This is a dramatized history of the war with actors portraying participants but also making use of documentary footage. I have not been able to find this film in one piece (probably because of copyright restrictions) although it’s possible to watch 9- or 10-minute sections of it on Vimeo. Plus Pan’s Labyrinth, The Devil’s Backbone, The Butterfly’s Tongue, Hemingway and Gellhorn, The Disappearance of Garcia Lorca and more. 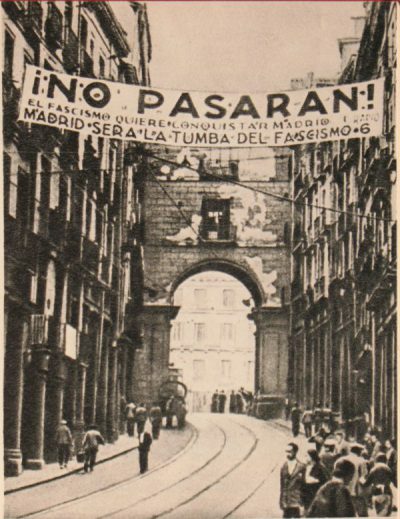 In conclusion, remember this for today’s protests: No Pasaran! Stuart Dybek at the Art Institute. Photo by Nancy Bishop. 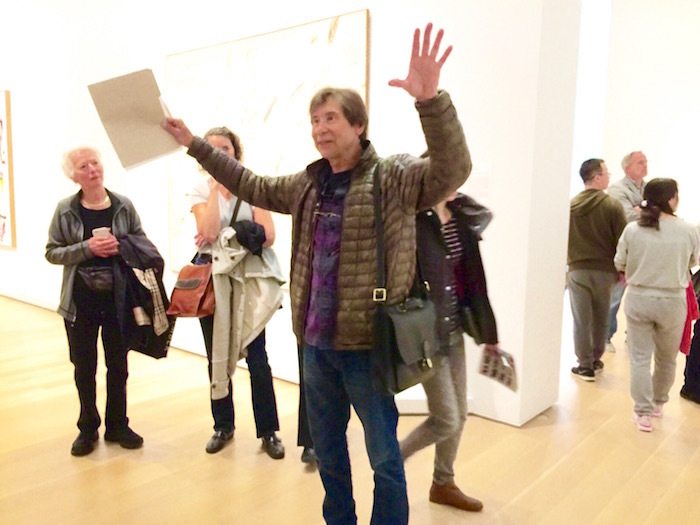 Last week I spent an hour wandering around the Art Institute’s Modern Wing with Chicago poet Stuart Dybek and a bunch of other poetry fans. As I described in my article on Third Coast Review, the Pop-Up Poetry event was designed for a poet to discuss works of art that influenced him—and how they related to the writing to be discussed. Dybek talked about a period in his life when he was interviewing for jobs and used the Art Institute as a place to hang out between interviews. Its pluses were that it had phone booths and clean rest rooms, but it also had light—light streaming in from skylights, but also the light glowing from the paintings of the Impressionists. He read a section from his book of short stories, The Coast of Chicago, called “Killing Time” about that experience. But he would always end up standing in front of Edward Hopper’s iconic “Nighthawks,” because he felt he needed the darkness to balance the light of the Impressionists. While talking about Hopper, he mentioned a book I was not familiar with. 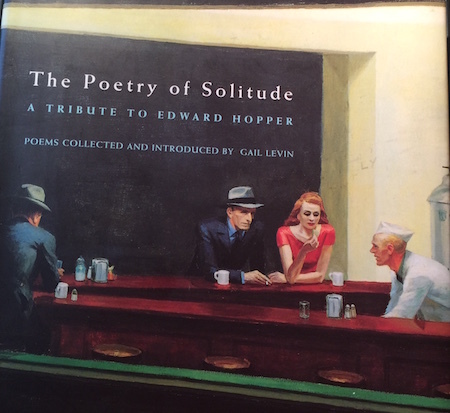 It’s The Poetry of Solitude: A Tribute to Edward Hopper, with poems collected and introduced by Gail Levin. He mentioned that the works of many well-known as well as obscure poets created word paintings that brought new meanings to Hopper’s imagery. Hopper’s work is quiet, even when several people are in the space within the picture frame. Are they lonely? Not necessarily. Being alone doesn’t necessarily mean loneliness. Lovely solitude. The book sounded fascinating and I looked it up when I got home. Nope, it was not in any bookstore I could find. Since it was published in 1995, I was afraid it would be out of print. But not so amazingly, I found it on amazon.com, for sale from one of the Amazon Marketplace vendors. I’ve had very good luck buying quirky, hard-to-find books that way, so I immediately ordered a copy that was described as being in very good condition. I was thrilled to find it in my mailbox yesterday and it is a treasure. It’s hard cover, a slim 80 pages, with a dust jacket. The size is 7.5 x 7.5 inches. In The Poetry of Solitude, poet Larry Levis tells a story about the woman in the 1931 painting titled “Hotel Room.” He suggests she has just finished arranging her mother’s funeral and her small estate. Touched it , or why …. As I described in my post about my hour spent with Stuart Dybek, he read his own poems and the work of other poets and reflected on the nature of words and images. The book gives even broader meaning to the relationship of words and images, narrative and abstraction. A note on the paintings mentioned here. You can see “Nighthawks” at the Art Institute. “Early Sunday Morning” is at the Whitney Museum of American Art in New York. “Hotel Room” is at the Thyssen-Bornemisza Museum in Madrid. If you do a search for “Edward Hopper paintings” online, you can see and enlarge thumbnails of all of them. Some 30,000 people viewed the funeral procession and attended the lively funeral service at the West Side auditorium (Racine and Harrison) on that November 25 (Thanksgiving Day) and his body was cremated at Graceland Cemetery. What happened to his ashes? That’s another whole story. 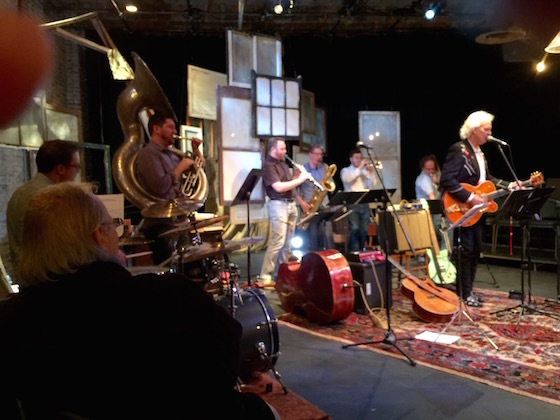 Bucky Halker, a singer-songwriter and PhD in labor history from the University of Minnesota, just released his new album, Anywhere But Utah: The Songs of Joe Hill, at an album release party at the Filament Theatre in the Six Corners neighborhood. Bucky played with the Big Shoulders Brass Band, featuring two saxophones, trumpet, tuba, trombone and drums. John Abbey sat in on upright bass on several numbers. Bucky and the band played two sets, including “Scissor Bill,” and concluded with a procession around the theater. 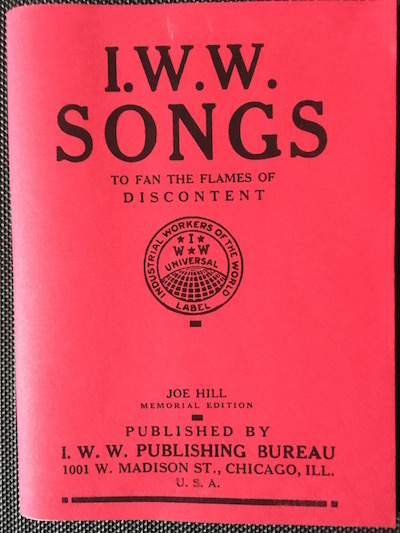 Here’s Bucky performing the Joe Hill song from the Little Red Song Book of IWW Songs. My week in Cuba: Land of hope and dreams? Cuba has always seemed a land of mystery, glamour, music and passion. The desire to visit lurked on the edges of my memory as I read books like The Mambo Kings Play Songs of Love (by Oscar Hijuelos), Dreaming in Cuban (Cristina Garcia), To Have and Have Not (Ernest Hemingway) and Los Guisanos (John Sayles). Films like Our Man in Havana, The Mambo Kings, Before Night Falls and even Chico and Rita, the 2010 animated film, enhanced my yearning for this exotic city. So I had my vision of Havana and Cuba and somehow, it took many decades before I finally achieved my Cuba dream. I spent last week in Cuba with a group of about 30 charming and interesting travelers as part of a Smithsonian Journeys tour. The week was fascinating and intellectually invigorating while also being tiring and enervating. Cuba is beautiful, its people are warm and welcoming, and its economy and infrastructure are in desperate need of investment and some good old capitalism. Here are my thoughts after being home for a few days. We may have renewed diplomatic relations with Cuba but the trade and travel embargo are still in place. You can’t go to Cuba by buying a ticket from Miami to Havana. US citizens risk prosecution if they travel directly to Cuba until Congress lifts the trade embargo, which requires action. (Congressional action; that would be an oxymoron.) You can travel to Cuba now with an educational or “people to people” mission, organized by a licensed tour organization. Besides your passport, you need a tourist visa to travel to Cuba. There’s a rumor that a bootleg trip to Cuba wouldn’t be tracked because the Cuban immigration officials don’t stamp your passport. That may have been true in the past, but our passports were all stamped on arrival and departure at Jose Marti International Airport. Smithsonian Journeys arranged our trip and all arrangements were managed extremely well. The Smithsonian tour manager (the saintly Claire) was extremely competent and attentive to our needs and schedule. Our local tour guide was Yoandry, a Cuban charmer who is very well informed but never strays from the party line. In addition, Enrique, an emeritus professor of Spanish from the University of New Mexico, was our study expert. Bernardo was our bus driver and maneuvered floods, 500-year-old cobblestone streets, and Havana traffic with skill. The coach in which we traveled around Cuba (far too much coach time) was comfortable, air-conditioned and equipped with vast quantities of bottled water. About half of the cars on Havana streets are beautiful old cars from the 1950s, most of them shiny and cared for. There are many new cars now too, however, especially Kias and Toyotas. Cuba has little or no internet access so my smartphone was used as a camera only. It is possible to buy internet cards and get spotty reception at hotels, but I had decided I was just going to put my phone on airplane mode for the week. I’ll just say that the only time we spent on the beach was at the Bay of Pigs invasion site. Trust me, this was not a resort vacation. See travel embargo above. Ernest Hemingway’s estate in Finca Vigia, just outside Havana. We were able to walk around the house but mainly peer in to the rooms through windows and doors. I also walked up the stairs of his “writing tower” to see the room where he wrote For Whom the Bell Tolls and The Old Man and the Sea. The docent was kind enough to take photos for me, including the priceless shot of his typewriter. A walking tour of Old Havana with a local architect, including a glimpse of the 1930 Bacardi building, a gorgeous art deco structure. We also visited Hemingway’s room in the Pink Hotel, where he lived with his then-wife, Martha Gellhorn, for seven or eight years. It’s on the fifth floor but the building has one of those cage-like old elevators. Hem got his exercise every day, going in and out to have lunch and drink daiquiris at the bar in Café Ambos Mundes. I have now visited five of Hemingway’s homes. I’ve visited his childhood home in Oak Park, his Key West home and I regularly walk by the building at 1239 North Dearborn Street where he lived in Chicago with his wife Hadley in 1921 (on the fourth floor of a 19th century row house, now a single family home). A tour of the University of Havana (founded in 1728 by the Dominicans) with Yoandry and university administrator Nestor as our guides. We met in the Aula Magna, the great hall, in the oldest building for a briefing and then walked around the campus. The university has about 12,000 students who receive their five-year undergrad educations and all services at no cost. A briefing at the US Embassy with the impressive political chief, Justin Davis. He gave us a good overview of the current Cuban political and economic situation and US legislation that restricts trade and travel. The embargo not only restricts investment by US companies; it prohibits any company that invests in Cuba from investing in the US. Cuba imports 80 percent of its foodstuffs, much of it from the US (agricultural products are excluded from the embargo) and most of its oil from Venezuela. Cuba exports only rum and cigars. About $2 billion of Cuba’s GDP is made up of remittances from Cuban-Americans. The average wage for a government worker is $25/month. He also discussed the political situation given the advanced ages of the Castro brothers. Raul Castro has said he will step down in 2018. The Cuban constitution allows only the Communist Party to stand for election. The likely successor to the Castros is the first vice minister, Miguel Diaz Canel. A meeting at Cuba Emprende, a church-supported nonprofit that trains and advises entrepreneurs. Raul Castro has loosened restrictions on private business and there is evidence of small business activity—especially in the paladars or privately owned restaurants and hostels—and this group offers workshops and advice for startups. We had a chance to visit a classroom where about 30 students were just beginning their four-week workshop on how to start and run a business. Most of them were starting small service businesses and many were hoping for capitalization, which is very difficult. Most entrepreneurs need their own savings or family money to get started. Visits to artists’ studios and shops in Havana and Cienfuegos and the Museum of Fine Arts in Havana. (I’ll write about the art and music scene in my next post, Cuba: Part 2. A briefing on the beach at the Bay of Pigs invasion site and a tour of the nearby Playa Giron Museum. I have absolutely no doubt that the CIA planned and botched the Bay of Pigs invasion and it was interesting to hear about it from a Cuban point of view. The museum was filled with captured American weapons, photos, maps and humorous propaganda on the bilingual exhibit legends. Farewell dinner. On our final night, we left the Hotel Nacional for our farewell dinner, expecting to be transported by our HavanaTur coach number 3779. Instead, a fleet of gorgeous 1950s convertibles was waiting for us and we cruised around the city like locals to the paladar where we dined. I rode with Miguel in a 1959 blue Ford convertible. On another occasion, I had a taxi ride in a 1973 Lada, with no window glass or seatbelts. The driver called it his Russian jalopy. May I say the Cuban people are beautiful? The men are handsome at every age and the women are equally beautiful. They are warm and welcoming without exception and those who speak a little English like to talk to Americans. Do not go to Cuba for the cuisine. Hotel breakfasts were okay and we ate all our other meals in paladars, many of which are in remodeled private homes. A few of the meals included tasty entrees or soups, but for the most part, the food is bland and boring. The typical menu is black beans, rice, and a choice of sliced pork, beef or chicken. Occasionally fish or lobster was served and one night I had a flavorful lamb stew. With black beans and rice. The Cubans don’t seem to have any herbs or vegetables for seasoning and don’t use much salt. About the middle of the week, I decided to ask for hot sauce (“Tiene usted salsa picante?”) and that improved the black beans considerably. Some people thought the food would be spicy but I had been to Cuban restaurants in Chicago so I knew what kind of a menu we would have. I was obsessive about not eating or drinking anything that would make me sick (having had a dreadful experience once in Mexico), so I drank only bottled water (as recommended), drinks sin hielo (and I love my ice), and no uncooked vegetables or unpeeled fruit. Liquor flowed freely and mojitos or other cocktails were routinely served at lunch and dinner; beer and wine were usually available too. Expresso was usually good but regular coffee was mediocre. I usually drank warm bottled water and was glad to get home to iced coffee and iced tea. The end of the Castro reign over Cuba probably will not mean much change, given the governmental structure. Images of Che are everywhere and he’s clearly a national hero, 48 years after his death. There’s Fidelismo too, but images of Che predominate. There’s no reason to be optimistic about political liberalization. However, the US trade embargo will probably be lifted in the next few years. The question is what kind of investment will result. I just hope that hundreds of golf courses don’t pop up on all that vacant farm land. But more foreign investment and more foreign visitors may well change the mindset and improve the financial wellbeing of the Cuban people. Cuba, of course, does not have freedom of speech or press. Right now, access to the open internet in Cuba is limited to about 5% of the population, nearly the lowest in the world. Investment is sure to bring better telecommunications and internet functionality. But will the government allow Cubans to access world news and use social media to communicate? The likelihood of a “Cuban spring” is low, it seems to me. Land of hope and dreams? Meet me in a land of hope and dreams. I feel that my week in Cuba was visiting a land of hope and dreams, but I’m not optimistic about when the Cuban peoples’ dreams will come true. Please watch for my next post on the lively art and music scene in Cuba. All photos by Nancy Bishop, taken with an otherwise useless iPhone 6-Plus. It was a slightly overcast Friday morning and that didn’t make me unhappy. Down in Battery Park, I could walk along the water without worrying about sunburn. It’s an easy place to reach on the #1 train from midtown. Battery Park is a beautiful place with gardens and monuments and an excellent white tablecloth restaurant as well as snack and drink stands. It’s the place where you can board a boat to take you to Ellis Island or the Statue of Liberty, but I’ve done those things before. I was interested in the new Sea Glass Carousel, which just opened in August. It’s housed in a circular building like a nautilus shell made of glass and steel that’s near the water and a short walk from the MTA station. The carousel is populated with many different types of fiberglass fish—a 14-foot-tall angelfish, a butterflyfish, yellow lionfish, triggerfish and a Siamese fishing fish, among others. 30 fish in all. For $5, you can sit in a fish of your choice and ride for about four minutes. Hip-Hop Revolution: Photographs by three photographers. I had seen Hamilton the night before, so of course I had to pay homage to the hip-hop artists who inspired Lin-Manuel Miranda. Activist New York. The drama of New York activist groups and issues over the years, from abolition (1830-65) and suffrage (1900-20) to civil rights (1945-64), gay rights (1969-2012) and bicycle lane advocacy (1965-2011). And a fascinating corner about the power of the pen: the Proletarian Literary Movement (1929-41). The exhibits are all well curated and displayed. The three-story building also has a cafe. And there’s a beguiling door that displays this title: “This is New York’s most exciting stairwell.” And indeed the stair is lined with posters and billboards illustrating the city’s history and culture. Over on Central Park West is the New York Historical Society, where I wanted to see the exhibit, Art as Activism. The exhibit asks the question: “How did political messages go viral before the internet?” and answers it in a mesmerizing way, showing 70 posters from the 1930s to the 1970s. They’re all from the Merrill C. Berman collection at the historical society. The posters are framed and installed like paintings. They tell stories you wouldn’t have learned in your US history classes unless you were using Howard Zinn’s remarkable People’s History of the United States. All photos by Nancy Bishop except where noted. 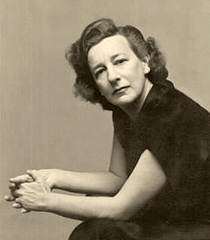 Last week I saw two masterpieces of 20th century theater by Lillian Hellman, the great playwright and leftwing political activist. (I‘m a fan on both counts.) The two shows were extremely different in production values but demonstrated the power of performance. The venal Hubbard siblings (Regina, Oscar and Ben) who fight over the family legacy and the spoils of a new cotton mill are played by Shannon Cochran, Steve Pickering and Larry Yando. John Judd plays Horace, Regina’s husband, and Mary Beth Fisher plays Oscar’s sweet and abused wife Birdie. The rest of the cast is equally excellent. The nearly three-hour play (with two intermissions) is not only a visual treat; it’s gripping from beginning to end. On Saturday afternoon, the Goodman presented an amazing one-time only event; a free performance of a reading of Hellman’s Another Part of the Forest, the prequel to The Little Foxes, which is set in 1900 and was first produced in 1939. Another Part of the Forest is set in 1880 and was written in 1946. Both are set in a town in rural Alabama and are based on Hellman’s own family story. It was a plain vanilla reading, not a staged reading where there is some blocking and action. The actors all had their scripts on paper and usually stood at music stands at the front of the stage area. When they weren’t reading, they sat on folding chairs at the rear. The most significant thing about the reading is that the 12-member cast was fully equivalent to that in the fully staged production. The acting was superb with attention to accents, vocal intonations, gestures and expressions. Some of Chicago’s finest actors were here too (none of them from the cast of The Little Foxes). Deanna Dunagan (you saw her as the mother in August: Osage County) plays Lavinia Hubbard, the siblings’ mother, whose fading memory comes through in the end. The always superb Larry Neumann Jr. read the part of Marcus Hubbard, the father who made a lot of money during the recent war, trading with the enemy (the Union forces). That’s the real source of the siblings’ later wealth. Neumann is one of those character actors who you’ve seen many times. He played the doctor in the legendary Famous Door production of the two-part Cider House Rules, Richard Nickel in Lookingglass’ production of They All Fell Down: The Richard Nickel Story; and Samuel Finkelbaum in Writers Theatre’s The Puppetmaster of Lodz. John Hoogenakker gave an excellent reading as Ben, the younger version of the character played by Larry Yando. (You may have seen Hoogenakker on TV in Chicago Fire or Empire or in Goodman’s The Iceman Cometh or Other Desert Cities. Steppenwolf’s Tim Hopper (Marie Antoinette, The Night Alive, Russian Transport) played John Bagtry, Birdie’s brother and the young Regina’s sweetheart. 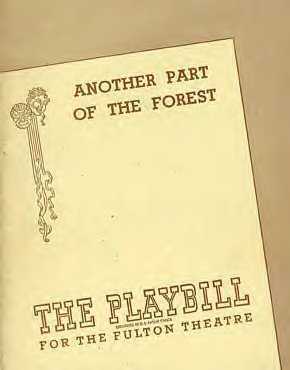 I thought perhaps Goodman would abbreviate Another Part of the Forest, but no, the full script was performed: almost three hours with two intermissions. The story was gripping from beginning to end and proved that great actors make you forget what they’re wearing or what the scenery behind them looks like. 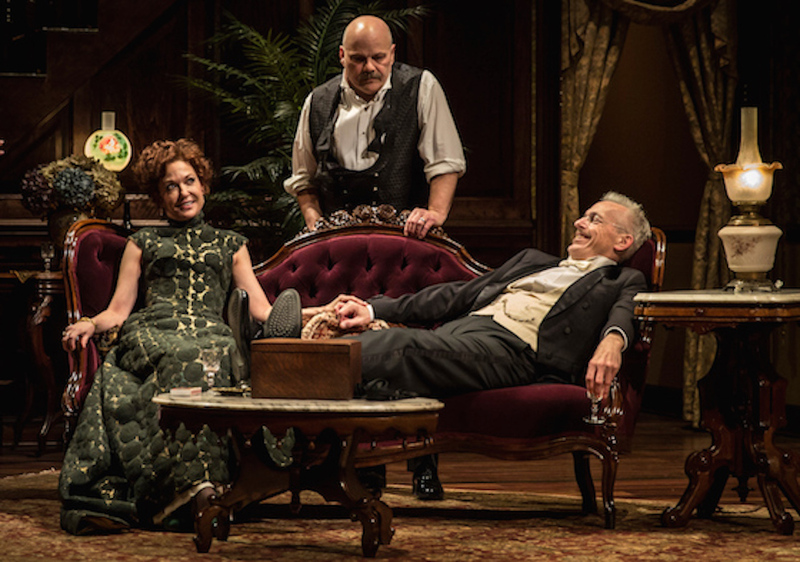 The Little Foxes continues at the Goodman Theatre until June 7. Sorry you missed the prequel. Also you can find 1940s film versions of both plays. John Brown’s body lies a-mouldering in the grave. But on a certain code, a manner of birth. Hung with hard jewels of electric light…. Benet’s book won the Pulitzer Prize in 1929. It’s not really great literature, because it’s rather uneven and not a little melodramatic. But it’s a great way to read the Civil War story. The book is out of print, but you can buy copies online.